In 1970s Boston, an arms deal gone wrong erupts into an explosion of prolonged gunfire. Frenetically choreographed and cartoonishly comedic, Free Fire is a virtuoso feat of indiscriminate gunplay - a shoot-’em-up in which no-one escapes unscathed in the hail of bullets of an absurd game of ‘every-man-for-himself’ personal survival. 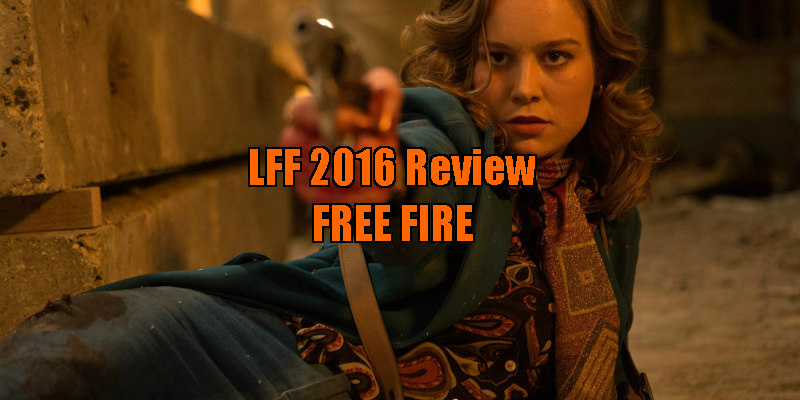 Director Ben Wheatley and writer Amy Jump’s mischievously satirical new feature, Free Fire is about people with guns, who shouldn’t have guns. Make of that what you will, but to give you the plot; the film is set in Boston in 1978, where a meeting in a deserted warehouse between two gangs negotiating an arms deal turns into the most protracted shootout ever committed to film. 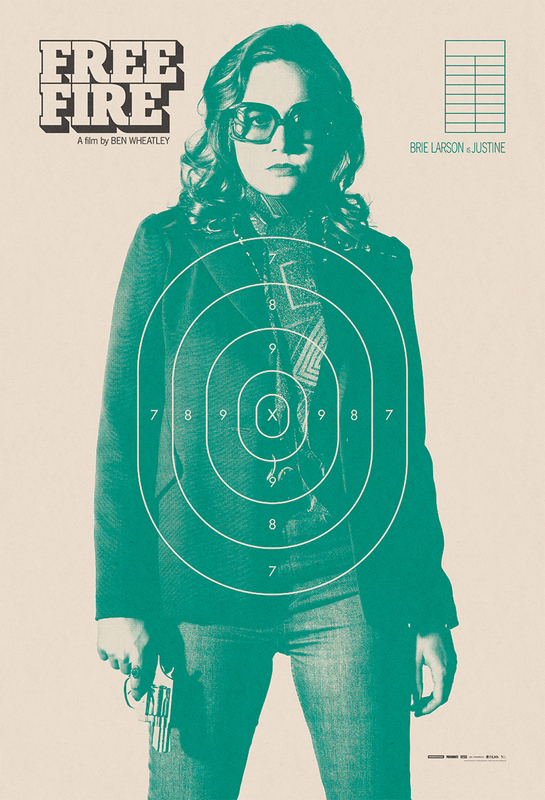 Brie Larson plays the only lady in a group of guys whose guns serve as obvious extensions of their egos, and who subject her by turns to overt 1970s sexism, or to a touching, gallant solicitousness. Jump’s script shows a cunning awareness of the males’ impulse to twitchily attempt to outdo each other in the Alpha Male stakes, a conventional scenario (as demonstrated so well in Athina Rachel Tsangari's recent film Chevalier), accompanied by an automatic impulse to impress the only female in the room. Handsome and vain negotiator Ord (Armie Hammer) and cool operator Justine (Larson) serve as mediators between two factions – the contingent who want the weapons, including Irish Republican Army operative Chris (Cillian Murphy), seasoned hardman and captain Frank (Michael Smiley), and dopey, drug-fuelled stooges Bernie (Enzo Cilenti) and Stevo (Sam Riley). The gun-runners are represented by weaselly wheeler-dealer Vernon (hilariously played by Sharlto Copley), his '70s Afro-sporting associate Martin (Babou Ceesay) and their sidekicks Gordon (Noah Taylor) and hothead Harry (Jack Reynor). Wheatley manages to amuse us while extending the suspense for nearly half an hour as we watch the touchy protagonists bicker about the shortcomings of the deal - but with 30 assault rifles changing hands and concealed weapons on everybody’s person, we know something is inevitably going to set these testy guys off. The deal is almost concluded before a random extraneous coincidence results in the first antagonistic shot being fired. By that point we have got the measure of the characters and probably know who we think deserves to get burned and who we would like to survive, but Wheatley and Jump are just playing with us – it could never be that simple. When the first hostile bullet hits and the recipient collapses in slow motion, it signals the moment for everyone to dive for the nearest cover and process what’s happening. From here on in, the mayhem and madness take over (as is usual in a Wheatley movie) and it’s a free-for-all as everyone sporadically scuttles about, popping out of their hiding places to blast a few blind rounds in the general direction of their enemies, hoping to hit someone from the opposing gang, and not always succeeding. Wheatley plays Free Fire as much for black comedy as suspense - he doesn’t want to kill anyone off too quickly, since it’s more fun to torment them with flesh wounds or laugh as bullets tear up the shoulder pads or sleeves of their tacky '70s suits. Editing the pandemonium of this Mexican Standoff (which DP Laurie Rose films from multiple angles) must have posed a challenge, considering the number of characters involved, which adds to the confusion of who is firing at whom. Free Fire sustains the carefully orchestrated mayhem for nearly an hour. The choice to set the action in the '70s not only affords the opportunity to involve the IRA in the deal, but also justifies the cringe-worthy facial hair, the hideous wardrobe, and an ironic soundtrack. It also ensures that no one can whip out a cell phone and call for back-up amidst the melée. Instead, the wounded characters have to undertake a suicide run to reach the warehouse’s lone landline phone situated in an upstairs office. Interest is also maintained by the differing motives of the various characters – some of the shooters simply want to reach the briefcase full of cash, others just want get out of the situation alive, while the most insane and dangerous of them see the violent chaos as the cover they need to settle personal scores. The bedlam is augmented by the unexpected appearance of two freelance snipers, hired by a mysterious double-dealer (whose identity remains hidden until the finale) to dispose of the other participants so they themselves can make off with the arms and the cash. In case you enjoy the gun-play in the film so much that you miss a message, remember that Free Fire is by a British film-maker, outside a gun-worshipping culture and cinematic heritage (even though Martin Scorsese is an executive producer) so I suspect here the implication is simply – ‘guns don’t kill people; intellectually-challenged, insecure, egotistical idiots do’. Free Fire is in cinemas March 31st 2017.